Industry loss ratios suggest that many carriers are still playing catch-up. With ultimate liability loss ratios above 70% and combined ratios several points above 100%, the industry still has work to do. Physical damage loss ratios have fallen 5 percentage points, to 60 percent. Physdam results don’t get split between commercial and personal auto on financial statements until year-end, but the improvement is probably weighted to the personal auto side, since personal physdam is more than 90 percent of total volume. So the landscape seems to be improving for personal auto but not so much for commercial . . .
. . . Which explains why the Council of Insurance Agents and Brokers reports that commercial auto rates are 7 percent higher than a year ago. It’s the 29th consecutive quarter (more than seven years) of rate increases. Economic Recovery and Miles Driven – The improvement in the unemployment rate puts more cars and a worse mix of drivers on the road. Driver Shortages – The trucking industry estimates a shortage of over 50,000 drivers by year-end, which leads to reliance on inexperienced drivers entering the industry. Distracted Driving – Cognitive distractions and smartphone addiction have contributed to higher accident severity, with statistics often being underreported. 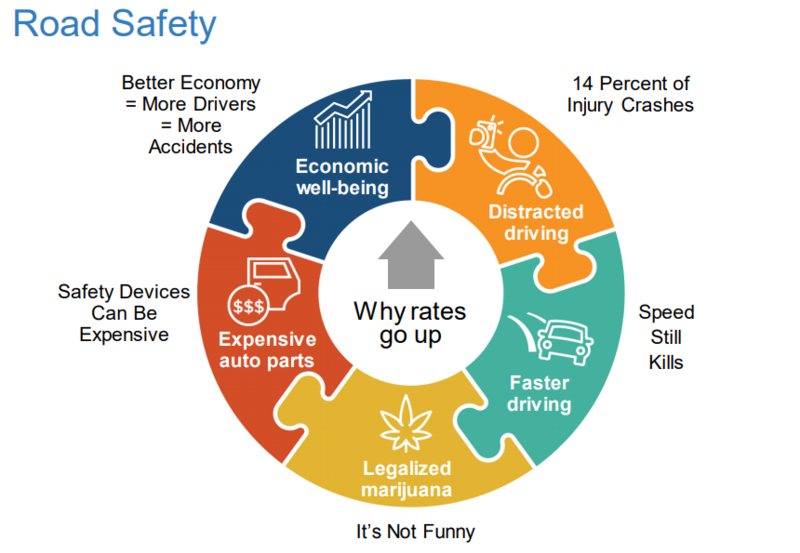 Drugged Driving/Marijuana – Studies from Washington, Colorado and Oregon find that accident frequency increased in the years after marijuana was legalized, and more states have since enacted similar legislation. Escalating Repair Costs – Advances in vehicle safety systems, including cameras and sensors, have grown repair costs significantly. Litigation/Jurisdiction – An active plaintiff’s bar, restrictive medical records laws, cost shifting, and litigation funding can drive up settlement values substantially. We’ve seen similar trends at I.I.I. and highlighted them in this presentation last March in Chicago. The key graphic from that presentation is atop this article. We add speed to the mix, because as cars get more powerful, people drive faster.